On her last day as Oklahoma’s 27th governor, Mary Fallin descended the State Capitol’s grand staircase and sat stage-left of a podium she did not take. Incoming Gov. Kevin Stitt followed the state’s first female governor down the Capitol steps, which provided a final procession for a woman who never lost an election, who oversaw a series of state firsts and controversial reforms, and who departs with an approval rating barely able to get in the bar: 23.4 percent, according to SoonerPoll.com. A former legislator, lieutenant governor and congresswoman, Fallin listened Jan. 14 as her successor preached reform and efficiency to a crowd gathered at the stoop of the people’s house, its emblematic state seal glowing brightly as a symbol of the new governor’s first day. Or of what could be the past governor’s lingering public legacy. Trait Thompson, State Capitol restoration project manager, was working for the Oklahoma State Senate in 2012 and remembers the Senate’s proposal of $160 million in Capitol repairs falling flat in the House. Thompson recalls Fallin as an advocate for the then-unpopular project, which now draws bipartisan praise as an investment in what some call Oklahoma’s top historical artifact. By March 2015, however, oil prices had plummeted to $51 per barrel, and financial analysts questioned the wisdom of Fallin and other Republicans who had pushed for the income tax cut in a state so dependent upon volatile commodity prices. Even as Fallin left office Jan. 14, that “debacle” continued to help define her legacy. Ben Felder of The Oklahoman reported Jan. 17 that “at least 24” open-records requests of Fallin’s office remained unfilled, some dating back to 2014. But Fallin’s gubernatorial tenure also stood as historic owing to who was in charge of the state: Republicans. Only the state’s fourth GOP governor, Fallin served as the first Republican executive with an entirely Republican-controlled Legislature, replete with infighting and turnover. During her eight years, she worked with four GOP speakers of the House and three president pro tempores of the Senate. Still, those Legislatures passed and Fallin signed a series of initiatives — tort reform, workers’ compensation reform, pension reform and tax cuts — championed for decades by Republicans. During work on those measures, however, Fallin became the focus of substantial criticism, even within her own party. and the largest tax increase in Oklahoma history, revenue from which was dedicated to teacher pay raises, increased education appropriations and state employee pay hikes. Passed with a historic and bipartisan supermajority, that package was partially spurred when Fallin vetoed further cuts to the state budget that had been authorized by GOP leadership during a 2017 special session. “What she did wasn’t going to be enough for the left, and she had to drag the right there kicking and screaming with the veto, and with some help from the Supreme Court,” Gaddie said of the historic tax increase. On Jan. 9 in a Capitol event room, Fallin made one of her final appearances as governor, meeting with several of the 30 Oklahomans whose prison sentences she commutated shortly before Christmas. She met with families and offered encouragement to those working to rebuild their lives after incarceration. Afterward, she discussed her eight years as governor. She recalled a conversation from the early 1990s while serving in the Legislature. Still, polling numbers indicate that only about one in four Oklahomans view Fallin favorably. Gaddie pointed to a particular public relations challenge that exacerbated Fallin’s image struggles. “She would fall back on folksy charm or humor when she was uncomfortable dealing with something, and sometimes it would fall flat. That’s what it looked like from sitting over here in the peanut gallery,” Gaddie said. “I think there’s a limit to folksy charm. Folksy charm is great when things are going well, but folksy charm doesn’t help you out when everything is falling apart around you. Throughout her career, Fallin faced plenty of criticism. She received a pejorative and alliterative nickname stemming from her high-profile divorce case, and her time in the national spotlight occasionally drew ridicule. Liberals laughed when she famously snagged an autograph from then-President George W. Bush, and conservatives guffawed when she voted for the Troubled Asset Relief Program during the 2008 financial collapse. As governor, she disappointed health care leaders by siding with conservative legislators who opposed expansion of Medicaid under the Affordable Care Act. But she also disappointed conservative legislators by vetoing the permitless carry firearm bill they sent to her desk in 2018, and Republican lawmakers formed a special committee to investigate what she and staff members knew about the Oklahoma State Department of Health’s 2017 fiscal implosion. In 2015, she saw her familial arrangement make national headlines after allowing her daughter to park a travel trailer outside the governor’s mansion. March 5, 2018. From left to right behind her: Sen.
What exactly people will say about Mary Fallin in 10 years remains to be seen, but her final days in office caused her to say a great deal about criminal justice reform, mental health care and addiction recovery. Wednesday, Fallin’s successor appeared at an Associated Press forum and picked up the reform baton ahead of his Feb. 4 State of the State address. “One of my big priorities is criminal justice reform,” Gov. Kevin Stitt told reporters, saying he is “open” to making SQ 780 retroactive for those currently incarcerated for drug possession. 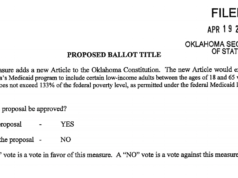 Afterward, Stitt confirmed that Fallin had written him a letter during the transition of power. Asked before leaving office what advice she would have for Stitt, Fallin spoke directly.